NETWORK FINALS: The NCIS: NEW ORLEANS rerun went up 0.1, but DATELINE lost the same in final numbers. CABLE HIGHLIGHTS: In the absence of any major sports events, Adult Swim’s late-night animation block had the lead on Saturday cable. DRAGON BALL Z ticked up to 0.68/1.482M, DIMENSION W fell 0.09 to 0.51, HUNTER X HUNTER lost 0.08 to 0.46/1.049M, SAMURAI CHAMPLOO dropped 0.09 to 0.39/925K, NARUTO downticked to 0.40/916K, ONE PIECE gained a hundredth to 0.37/916K, and PARASYTE was also up a tick to 0.33/705K. 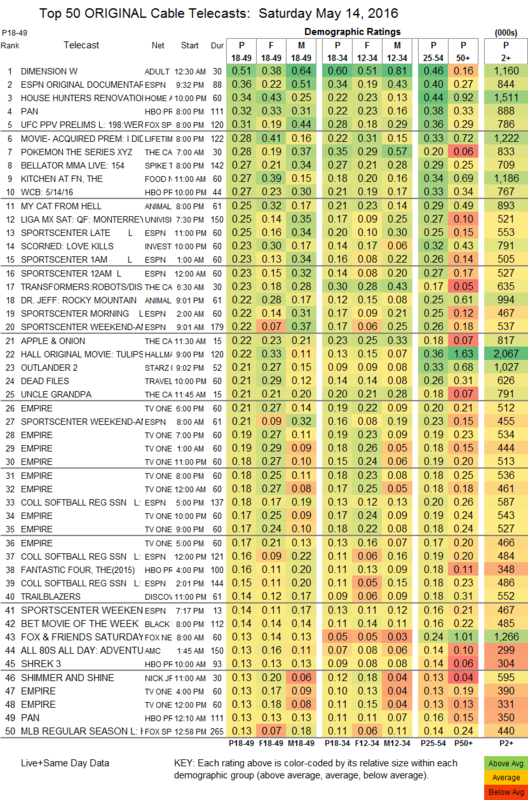 Elsewhere, ESPN’s 30 FOR 30 documentary was at 0.36. HGTV’s HOUSE HUNTERS RENOVATION was steady at 0.34. Fox Sports 1’s UFC Prelims was at 0.31, Spike’s BELLATOR LIVE was at 0.27, and BOXING on HBO was also at 0.27. Cartoon Network’s 7AM POKEMON was up 0.07 to 0.28. Food Network’s KITCHEN AT FN dipped 0.02 to 0.27. Lifetime’s movie I DIDN’T KILL MY SISTER was at 0.28, and Hallmark Channel’s movie TULIPS IN SPRING was at 0.22. Starz’s OUTLANDER held at 0.21.